What does it take to be on top of the mountain or to be a champion? Does it take wishing, hoping, or waiting? The answer is none of these. It takes hard work, dedication, and patience. When you are willing to put in the time and effort, and have a little patience, it is gratifying to see the results that you seek, results that come with hardwork and sweat. To be good at anything takes hours of practice and patience. I got to see this firsthand in Davie when young talented, boxers, who practice day in and day out in the gym, display their skills in the ring. These young talents are seeing at an early age that nothing is going to come to you just by sitting and waiting. Young up and coming 90 lb. weight class boxer, Justice Henry, has been boxing for about four years. “I saw my dad coaching, and I wanted to see if it might be fun,” he says. Introduced to boxing through his dad, you could see the love for the sport and the talent. Those four years of dedication have been paid off. I also saw the love of the sport and the talent when Bryce Henry, coached by Mace, of Bang Boxing Camp, went into the ring for his match. In this match he was more polished, and agile and I saw a marked improvement from his earlier fights. He was moving better, waiting for his opportunity, and striking when he saw an opening. For those rounds, I did not see someone just going in there and recklessly throwing punches. I saw a decision maker playing chess instead of checkers. I could see someone continually climbing to reach the top. Those hours of practicing in the gym were paying off. I anticipate his next fight, looking for growth and improvement. 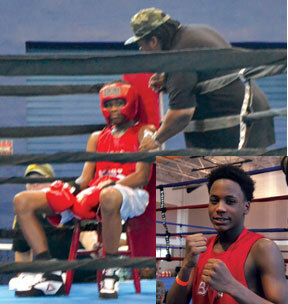 Bryce, boxing at 132lb., is in his second year and has compiled a 5-2 record. “I wasn’t nervous at all, during the fight,” Bryce says. He got into boxing one summer, because it looked like fun and there was nothing else to do. He didn’t look anxious in the ring; he looked cool, calm, and collected. Bobby III (Tre), is the 2016 State Pal Champion with a 3-3 record. If there is something in life that you really want to do, boxing trainer and former boxer Tony Bradham has some good advice. “Start early; start while you’re young. I wish I would have started earlier,” Bradham said. When you start early, you have a chance to grow and succeed in whatever it is when you get a head start. I saw a lot of young talent in that ring when I was there, and if they stick with it, some of them can climb and reach the mountain top. However, it won’t be easy but no one ever said it was going to be easy. To reach the finish line, you will have to leave a trail of sweat along the way.